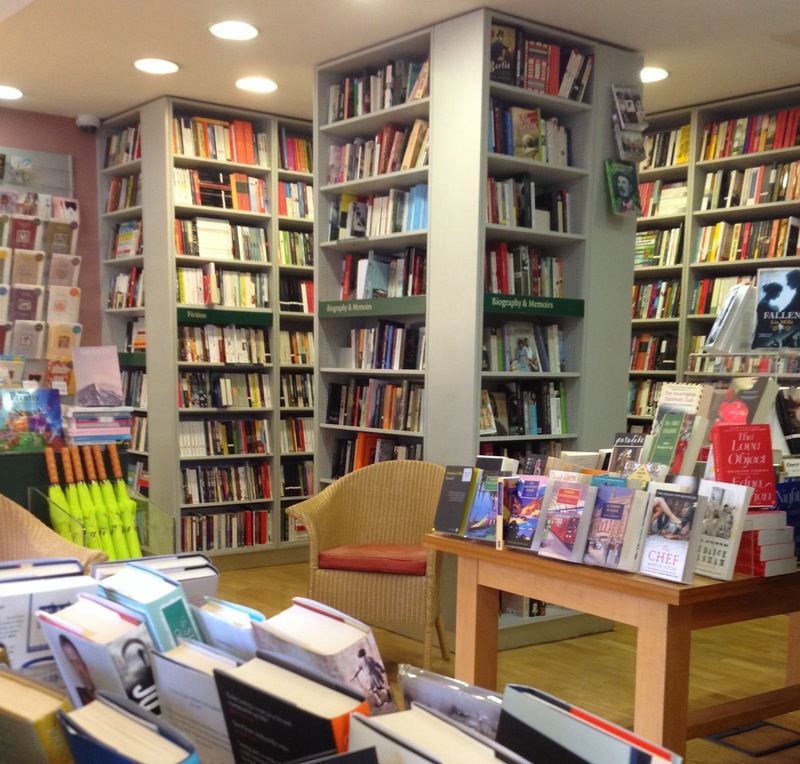 This blog thrives on recommendations, some of which I manage to visit within days, others take much longer, such as London Review Bookshop. As the first place recommended before I'd even written a word, it took approximately 370 days before I finally made it through the doors of this central London bookshop, which is probably a shameful thing to admit given how close I live to the capital. But if there's one thing I've learnt with bookshopping, it's that - just like you wouldn't turn straight to the back page of a book - bookshop visits can't be rushed. Even when they include cake. It wasn't for want of trying, but life has a habit of getting in the way. Not forgetting a lack of geographical knowledge meaning – despite several visits to the British Museum over the past year – I hadn't realised how close to London Review Bookshop I was. Indeed, having walked the long way from Russell Square and entered the bookshop through another square around the back, it wasn't until after I'd finished my visit that I realised I was less than a minute from the popular destination. But back to the important stuff. 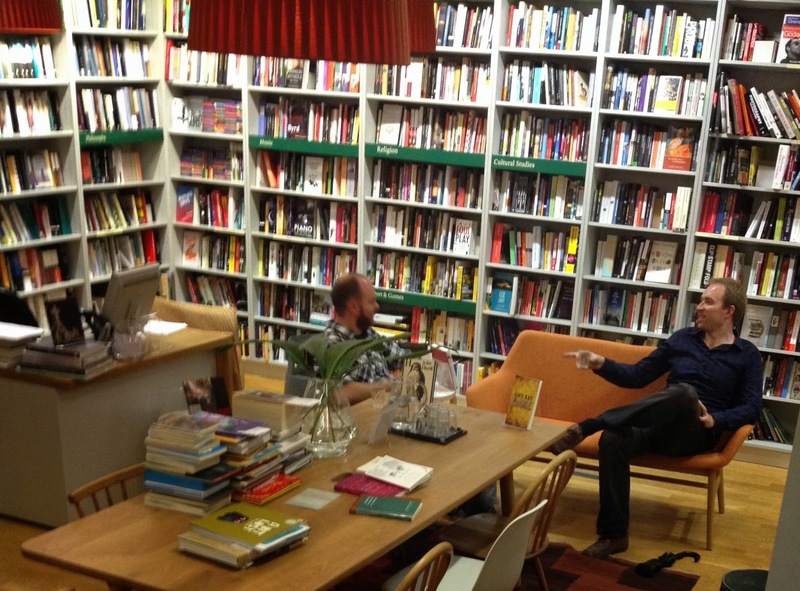 London Review Bookshop is one of the more famous indies I've had the pleasure of visiting, with its own magazine – London Review of Books – and cake shop, with the former enjoying a massive following. All of which made me uncertain of what to expect and, frankly, terrified of writing about somewhere that's already so well known and loved. Meaning I never pushed too hard when trying to pin down a friend to meet for tea, cake and a browse. Which is a shame, because I've been missing out on a lovely little bookshop. Entering by the back I immediately stumbled into the sprawling fiction section and could see why the magazine has picked up such a following. The shelves are crammed with every author you could wish for, from best sellers to little known gems, with a recommendations table that must surely be 100 per cent unique in its choice of titles. I forgot about my friends as I browsed the books on offer, delighting at the sight of complete collections by authors I know and love alongside lesser known names I've spent years hoping to stumble across in the real world (even with bookshop ordering services I'm a firm believer that some books are meant to be found, rather than chased down). Beyond the fiction there were books crammed into every corner, and if bookshoppers choose to venture behind the till they'll find stairs to the basement and a well stocked children's section, more non-fiction and a comfy seating area to rest a while, enjoying the peace and calm of your surroundings. Not that anyone would want to sit downstairs for too long when there's the lure of the cake shop next door. Entered via the bookshop, this is no ordinary cafe, but a reading cake lover's paradise complete with tea menu and more books to drool over (hopefully not literally). Having no clue about anything other than a cup of Tetley, I confess I was a little bewildered when handed the tea menu, but clear explanations of the tea plus a chat with the waitress meant I was soon happily ordering a pot of Pheonix Honey Orchid to go with my carrot cake. Further confusion ensued when a gorgeous glass tea set was placed in front of me, but again the waitress immediately explained my order and I soon found myself the envy of my friends as they sipped on their sensible drinks. Given I was the only reader in our group, I was surprised when I realised we'd enjoyed a good couple of hours in the book and cake shop. Had I been alone I could've possibly dragged it out even longer as I got comfortable in the cafe, but as it is I had to be sociable. 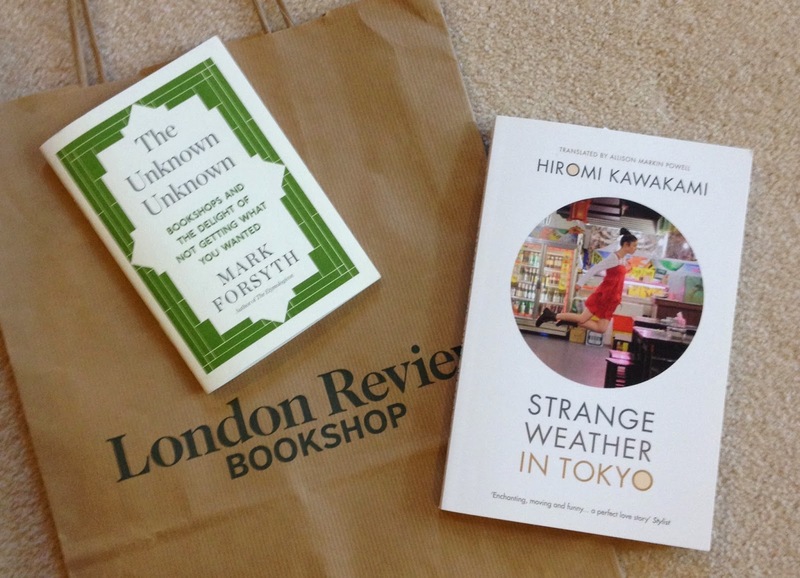 My purchases of Strange Weather in Tokyo by Hiromi Kawakami and long-awaited find of The Unknown Unknown by Mark Forsyth had to come home to be read instead. My bookshop visit may be over, but the memory lives on every time I turn a page. This is one of my absolute favourite bookshops. My sister used to live in London until very recently, and almost every time I went down to visit we would manage to sneak in a visit. I'm very impressed you braved the tea menu - I keep promising myself to be more adventurous next time! If you are looking for recommendations, may I suggest the University of Leicester Bookshop, which is on campus in the David Wilson Library? I'm sure my university fate was sealed when I visited the bookshop and library combo on an open day. I'm not sure I'd've managed to brave the tea menu if the waitress hadn't been so helpful in her explanations and recommendations in relation to what type of cake I was going to have. And thank you for the bookshop recommendation, I'll add it to my list. Most of the time I'm on my own but whenever possible I drag a friend or two along for company (and to hopefully inspire them to love bookshops as much as I do). I'll definitely let you know next time I'm in the area. Also, definitely try the tea menu - there wasn't space to go into detail but the brewing/pouring experience in the glass tea pot is an experience in itself! PS...I love this bookshop too. I've never ventured into the cafe (cakes are not cool for diabetics) but I didn't know about the 'tea menu'. Next time I'm there, I'll try it out.